What is WordPress Theme Unit Test Data? Theme unit test data is an XML data file that contains dummy content for WordPress theme development. It is used by WordPress theme developers to test their themes. It is also used by WordPress theme review team to test the themes for inclusion in WordPress theme directory. When creating a WordPress theme, there are a number of things that you need to consider such as images, links, widgets, post formats, galleries, lists, comments, page navigation, etc. You need to make sure that your theme is ready for all these elements that a typical WordPress site is supposed to handle. Theme unit test data helps you test your themes for HTML tags, formatting, navigation menus, comments, widgets, etc. This allows you to create a theme that is truly compatible with WordPress. It is extremely important to test your theme with theme unit test data when you are planning to publicly release a theme. First you need to download the XML file for theme unit test data. Go to Tools » Import in your localhost development environment. On the Import screen, click on WordPress and a new popup window will appear asking you to install the WordPress importer plugin. After installing and activating the plugin, you will be redirected to the importer asking you to upload a WXR (.xml) file. Upload the XML file you downloaded earlier. On the next screen select the authors you want to import and download attachments. The importer will now import the data from XML file to WordPress. Once it is done, preview your site to make sure that all new content is there. What’s Included in Theme Unit Test Data? Everything that you would need to test your WordPress theme is packed in theme unit test data. It has categories, child categories, menu items, nested comments, pages, sub-pages, images of different sizes, image alignment, etc. 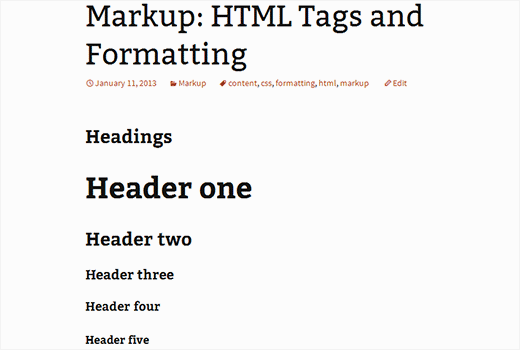 There are lists, blockquotes, links, code, and other HTML tags that you should style in your themes. It is a comprehensive set of dummy data which is far better than using a dummy content generator plugin for WordPress. 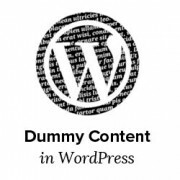 We hope that this article helped you add dummy content for theme development in WordPress. If you have any questions or feedback, then please leave a comment below. Also don’t forget to follow us on Google+. Wow! I’ve been creating this stuff one my own. Never thought to export it and reused it – DUH. Thanks for the amazing started kit. Happy developing. Thank you, not all of it worked during the upload but it was mostly images. Either way, this made my life a ton easier. Thank you much, also, maybe take out the deprecated stuff? just a thought. Sometimes we download multi-purpose themes then we imports dummy data or sample xml file but I dont need unnecessary pictures, pages, posts, etc.. How can i seperate / edit this dummy data without notepad? Why asking this question cause i done a project my subdomain after then i migrate to my main website but I realized theme files size is about 500 Mb. and i removed unnecessary pictures in uploads file. There is question : How can i seperate unnecessary pictures, pages etc. in XML file before i upload ? Failed to create new user for themedemos. Their posts will be attributed to the current user. Failed to create new user for chipbennett. Their posts will be attributed to the current user. Failed to create new user for lance. Their posts will be attributed to the current user. Failed to create new user for emiluzelac. Their posts will be attributed to the current user. please help as I cannot see any dummy post in my wordpress except form hello world. This is great and awasome! Thanks! WP Test (http://wptest.io/) is a really thorough set of test data for everything in WordPress. but after development is done. is there simple way to delete all dummy contents? if its an empty installation with just the dummy content then you can reset your WordPress database to default settings. But if it has other content that you do not want to delete, then back up it first. Theme unit test data is awesome, I’ve only recently started to use it and its a true life saver – gone are the days of waiting for css issues to be discovered, you can nail them all in one hit!